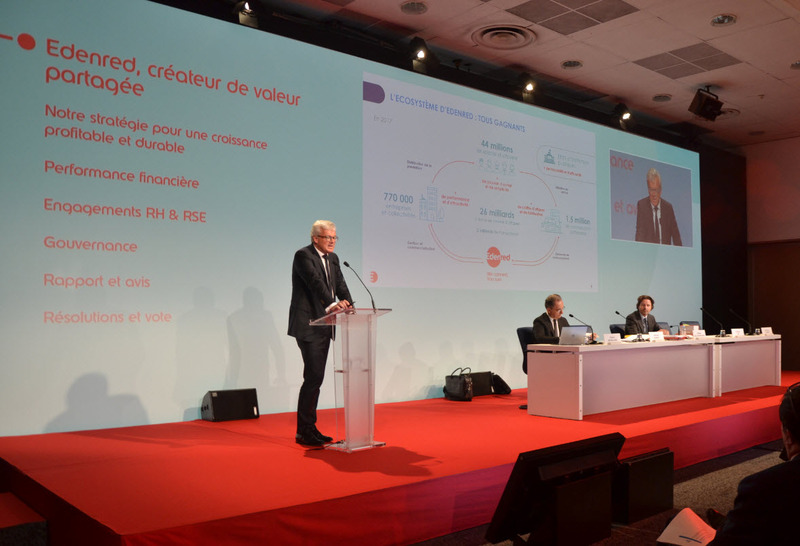 Edenred, the world leader in transactional solutions for companies, employees and merchants, held its Annual Shareholders Meeting in Paris yesterday, chaired by Chairman and Chief Executive Officer Bertrand Dumazy, and attended by more than 150 shareholders. During the Group’s Annual Shareholders Meeting, Bertrand Dumazy spoke about Edenred’s ability to generate profitable and sustainable growth by supporting transformations in society and new user behavior in the world of work, as well as how to share this growth with all of its stakeholders. Further details on these topics can be found in the Group’s first Integrated Report, available now on www.edenred.com. 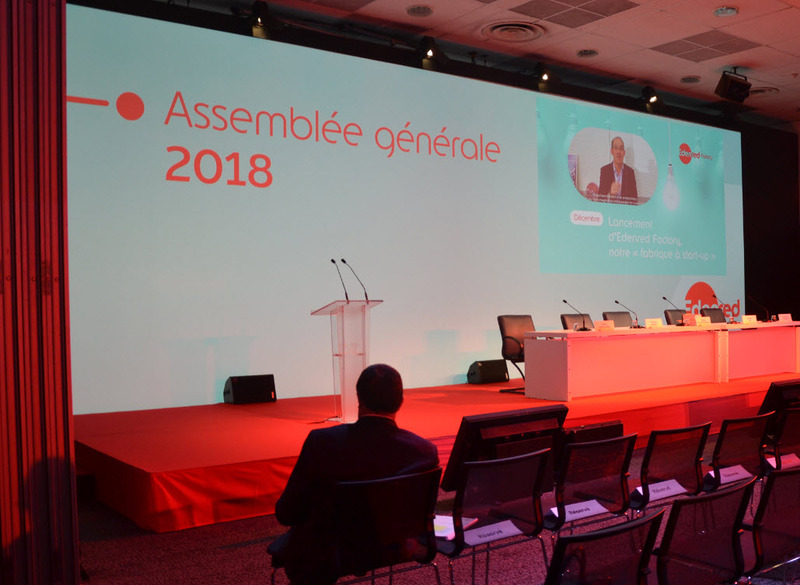 After a progress report on the results of the Fast Forward strategic plan, including those related to rebalancing Edenred’s business portfolio and accelerating its transformation into a digital native company and pioneer in mobile and integrated payment, Bertrand Dumazy and Patrick Bataillard, Executive Vice President, Finance, presented the Group’s record 2017 financial results. In particular, they highlighted Edenred’s significant growth in EBIT, which rose by 18% to €437 million, and the 37% jump in net profit to €247 million, which enabled a higher dividend of €0.85, representing a 37% increase. Bertrand Dumazy and Patrick Bataillard also discussed the Group’s strong cash generation over the past two years which, through the acquisitions of Embratec and UTA, has notably accelerated the development of the Fleet & Mobility Solutions business line. In line with this, operating revenue for the segment climbed 68% in 2017 and now represents 25% of the Group total. At the same time, Edenred has managed to maintain high shareholder returns and a level of debt low enough to support a “Strong Investment Grade” BBB+ rating by Standard and Poor’s. In addition, Bertrand Dumazy and Jacques Adoue, Executive Vice President, Human Resources and Corporate Social Responsibility, presented the Group’s HR and CSR commitments, with a focus on the initiatives undertaken to attract and develop talent, including Edenstep, Edenred’s graduate program since 2017 that each year accepts young graduates worldwide. Lastly, the meeting provided an opportunity to unveil the Group’s new CSR approach based on three pillars: improve the quality of life of its stakeholders (People), preserve the environment (Planet) and create value by developing its business and partnerships in a fully responsible way (Progress). With a quorum of 77.48%, all of the resolutions proposed by the Board of Directors were approved, including the payment of a 2017 dividend of €0.85 per share, with the option of receiving 100% of the amount in new shares. The dividend will be payable from June 8, 2018, with an ex‑dividend date of May 14, 2018. The option to receive the dividend in new shares must be exercised between May 14 and the close of business on May 25, 2018. Any shareholder who has not exercised their option by the close of this period will receive the entire dividend in cash. Also during the meeting, shareholders renewed the directorship of Bertrand Dumazy, as well as that of Gabriele Galateri di Genola, Maëlle Gavet and Jean-Romain Lhomme, for a period of four years. In addition, shareholders ratified the cooption of Dominique D’Hinnin as director. The Board of Directors currently has ten members, 90% of whom are independent and 40% of whom are women. The full results of the resolution votes, as well as a summary of the meeting, will shortly be available in the Investors/Shareholders section of www.edenred.com. The option to receive the dividend payment in shares does not constitute an offer or a solicitation to subscribe to or purchase securities in the United States within the meaning of the U.S. Securities Act of 1933, or in any other country where such transaction would be contrary to the applicable laws and regulations. The option to receive the dividend payment in shares is not available in certain countries, such as those where such an option would require registration with, or authorization from, the local securities regulator. Shareholders residing outside France should inquire about and comply with any local restrictions.